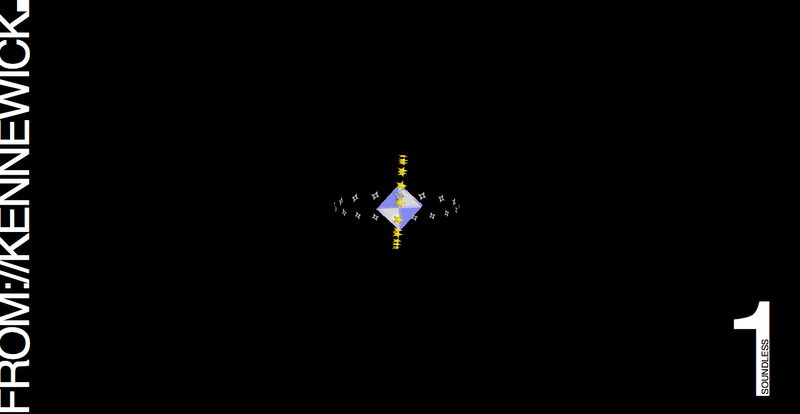 Conceived in 2012, the first demo was released in 2013 at Revision. It is currently comprised of a single developer, who has no music compositional sense whatsoever, from Washington state (USA). 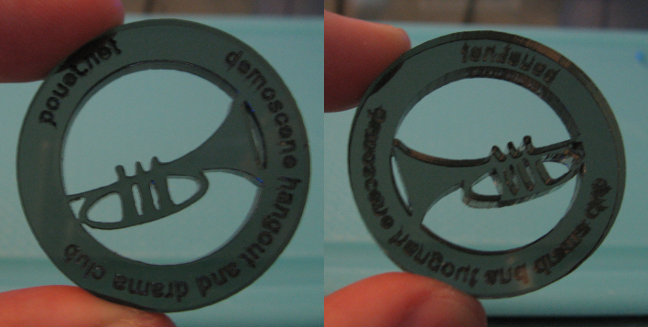 A new prod was released at Sundown 2015 that shows some of the process of making the key fobs I had brought with me. The demo isn't very long and is relatively simple. 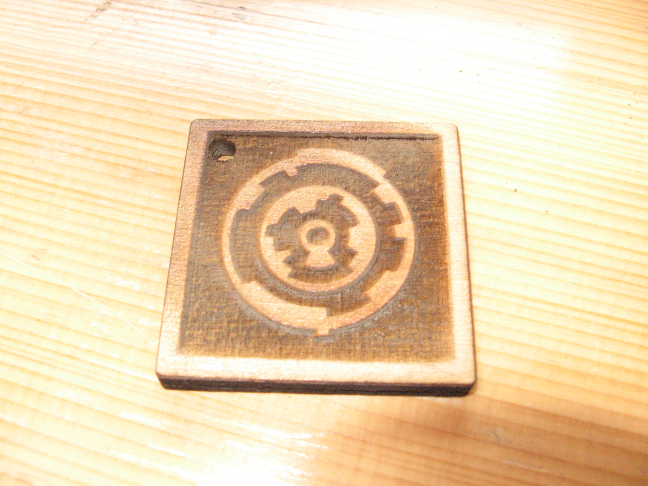 I haven't stopped laser cutting things. However I've moved resources about my activities to lasers.asmcbain.net. Please see that website if you're looking to contact me about doing something. 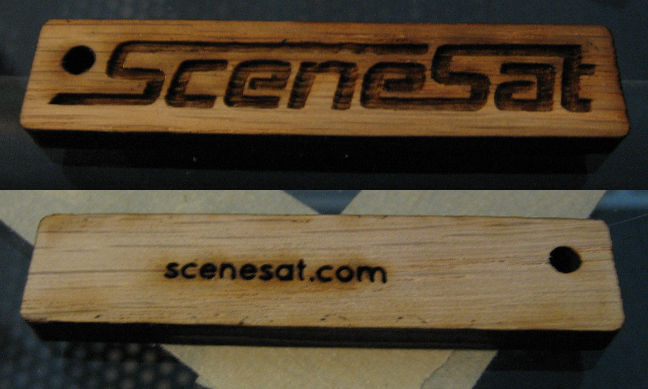 One of my hobbies is laser cutting. 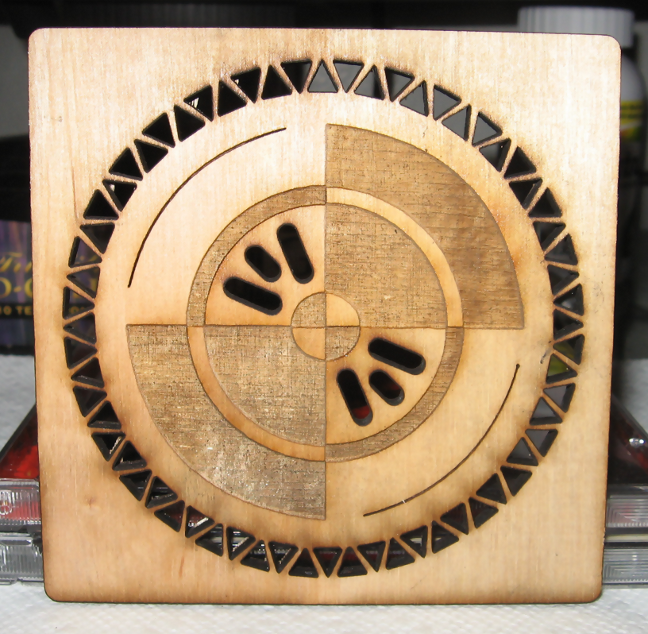 I make my own designs, though some things are borrowed, and have them cut out at a hackerspace. I am quite happy to take on personal and scene-related projects. I have done key fobs for websites and demoparties, awards for competitions, and game pieces based on a client-provided design. I have access to 3mm, 5mm (limited), and 6mm thick plywood as well as a variety of acrylic (mostly 4.5mm thick). I can create designs, if needed, but for more complex things it is easiest if you have a design ready, preferably in SVG. Provided designs may need to be tweaked to get a better result. Costs can vary a lot by design so unfortunately I cannot provide anything concrete in this space. Be aware, however, the hackerspace where my work is done may not be the absolute low cost option as it not a factory. Regardless, I do try to achieve the best cost I can. Finally, due to travel required to get to the hackerspace, I generally cannot do production runs from November through February. I am still available for everything else. 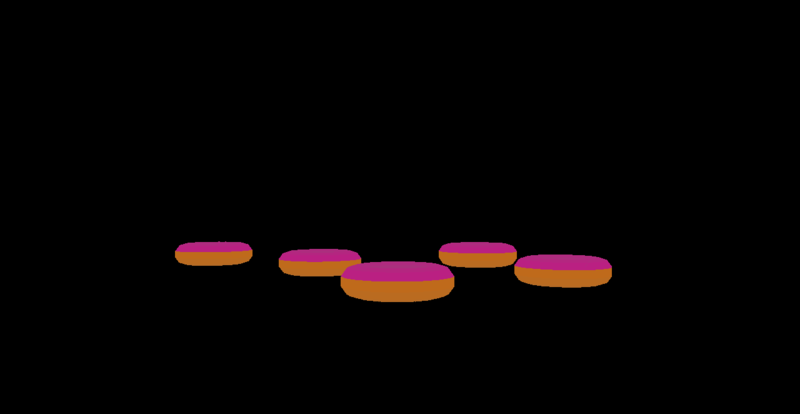 1k browser demo, again using 3D CSS, to "simulate" a bunch of falling "donuts". With barely enough room for it all after packing, careful work and magic incantations were required to get the most out of packing in to an image. Same as the last demo, it requires Firefox (16+) though the with addition of prefixes it could work in other browsers. This is actually demo four, as two and three were started (but perhaps not enough to count) before this one. The demo was originally intended for release at @party but my video card died before I got far enough along. The final idea then came together about two and a half weeks before TRSAC, where it was shown. This group would love to continue giving out these key fobs for free. Unfortunately, making these key fobs isn't costless. There's no need to donate as the fobs will happen anyway, but if you got one and would like to help out or just like the idea, a few spare dollars or euros would help defray costs. (Save large donations for parties.) The designs will be the same. Sorry, I've closed the donation bins for now. Thanks to all who sent something this way, it was much appreciated. If you would still like to contribute, please contact AMcBain to work it out. The name is intended to lampshade the demo's lack of a soundtrack. 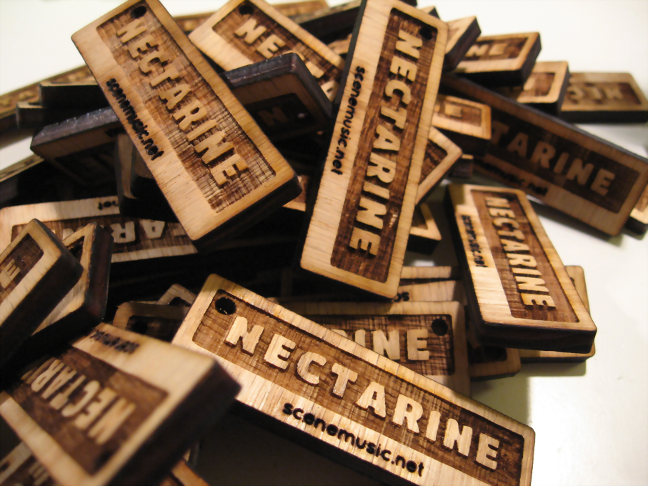 Offers have been made via Nectarine to help provide a soundtrack for the next release. Something in-house might be hacked together before then, though. Needs Firefox 16+ until further notice, as support in other browsers for 3D transforms or such transforms used with animations is incomplete in some manner yet. These key fobs with the Revision logo were passed out at Revision 2013. They're laser-cut from plywood. Both sides had the same design. Figured this as-yet one-man demogroup should officially take credit for more than just a single release to get started. People really seemed to like them, especially the organizers. Sorry to any organizers who didn't get one. Only about 45 were made in total. They may return at a future Revision party with a slightly different design, but that remains to be seen. These will never be given away outside of the party. "You have to be [there] to get one."